Arapahoe Basin, CO – In case you were stuck behind a desk on Friday, here’s a photo recap for a peek at Colorado’s ski and snowboard season opening day. 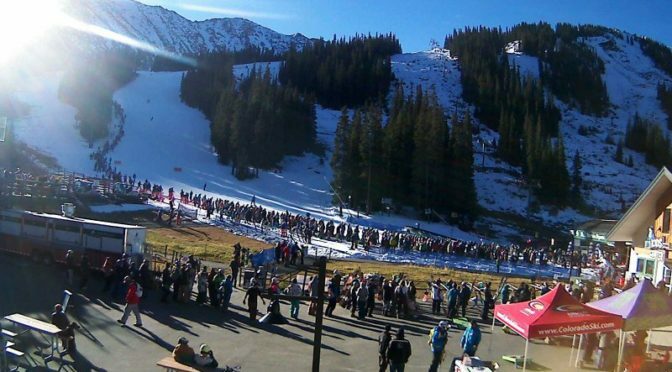 Arapahoe Basin Ski Area was able to open its High Noon run to several thousand excited skiers and snowboarders on Friday the 13th. The Black Mountain Express lift started turning at 9:00 a.m. and will run seven days a week into June, when the ski area is slated to close. Crowds flocked to the slopes for early turns, with laps on Black Mountain Express reportedly taking about 30 minutes once the pre-opening liftline dissipated. Snowmakers have already begun work on the next trail to open, Ramrod, and everyone is doing their snow dances in hopes that Mother Nature will bring the powder this season! Although many media outlets are reporting that A-Basin was the first ski area to open in the nation this season, that title actually goes to Timberline Ski Area in Oregon, which opened its permanent Palmer Snowfield to skiers and riders last weekend, and added its Pucci lift to the open terrain offerings yesterday.